Well now you can find out exactly what happened when the boys in black and white played on 11th November – Armistice Day, when the nation pays tribute to all those who died in World Wars One and Two and in every conflict since. 7 years ago on 11 November 2008 – The Swans suffered their first home defeat of the season as they lost 1 nil at the Liberty Stadium to Coca Cola Championship rivals Watford in the 4th Round of the Carling Cup. 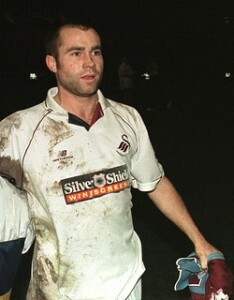 Irish defender Steve O’Halloran made his debut for the Swans in front of the 9,549 crowd. 9 years ago on 11 November 2006 – The Swans eased past Newport County at Newport Stadium after 3 first half goals from Lee Trundle, Izzy Iriekpen and Leon Britton. Newport scored a consolation goal in the 2nd half, but this FA Cup 1st Round tie will probably be best remembered for an incident involving the fourth official, after he was struck by a coin, shortly after Newport manager Peter Beadle had been sent to the stand. 15 years ago on 11 November 2000 – Bottom of the table Oxford United beat the Swans 2-1 at the Vetch Field in Nationwide League Division Two. The crowd of 4,892 had very little to shout about other than Steve Watkin’s 12 minute goal had given the Swans the lead. Matthew Bound was sent off in the 2nd half to round off a miserable afternoon for the 21st placed Swans. 18 years ago on 11 November 1997 – A young Swans team under the guidance of Alan Cork, lost 1-0 at Bangor City in the FAW Invitation Cup in front of a Farrar Road crowd of 744. 20 years ago on 11 November 1995 – Fulham hammered the Swans 7-0 at Craven Cottage in the Littlewoods Pools FA Cup 1st Round. The game was over within the first 30 minutes as the Swans went already 4 nil down. Nick Cusack and Martin Thomas – both of whom went on to play for the Swans – added to Fulham’s tally in the second half on a disastrous day for caretaker manager Bobby Smith. 26 years ago on 11 November 1989 – Goals from Andy Melville and Terry Boyle helped the Swans to a 2-1 Vetch Field win over Preston North End in Barclays League Division Three. The 3,843 crowd also witnessed the 11th placed Swans concede their first goal in 4 games. 27 years ago on 11 November 1988 – Current Swans defender Kyle Naughton is born in Sheffield. 29 years ago on 11 November 1986 – Newport County dumped the Swans out of the Welsh Cup in the 3rd Round, running out 3-1 winners at the Vetch Field in front of 4,756. Nigel Stevenson had given the Swans a first half lead, but a poor 2nd half defensive display cost Terry Yorath’s Swans the game. 35 years ago on 11 November 1980 – The 5th placed Swans grabbed a point at Shrewsbury Town in the Football League Second Division with a battling 0-0 draw. It was the Swans 8th successive away game without defeat. 37 years ago on 11 November 1978 – A solitary goal from Robbie James was enough to give the Swans a 1-0 victory at Bury in the Football League Third Division. Leighton Phillips made his Swans debut as Geoff Crudgington saved a 2nd half Bury penalty to ensure the Swans came home with all the points.